The Scottish National Party has published a booklet of detailed proposals for Scottish independence, including the planned independence day -- Easter Thursday 2016, just days before the 100th anniversary of Ireland’s Easter Rising -- as well as assurances that Scotland would retain the Sterling currency and the Queen of England as monarch. 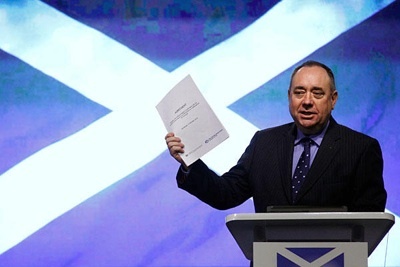 The following is the text of SNP leader Alex Salmond’s preface to their independence guide. Scotland is an ancient nation, renowned for the ingenuity and creativity of our people, the breathtaking beauty of our land and the brilliance of our scholars. Our national story has been shaped down the generations by values of compassion, equality, an unrivalled commitment to the empowerment of education, and a passion and curiosity for invention that has helped to shape the world around us. Scots have been at the forefront of the great moral, political and economic debates of our times as humanity has searched for progress in the modern age. The answer we give to that question will determine how we can shape our nation for the future. The year ahead should be a national celebration of who we are and what we could be. The debate we are engaged in as a nation is about the future of all of us lucky enough to live in this diverse and vibrant country. It is a rare and precious moment in the history of Scotland - a once in a generation opportunity to chart a better way. At its heart independence is not about this Government or any political party. It is about a fundamental democratic choice for the people of Scotland. It is about the power to choose who we should be governed by and the power to build a country that reflects our priorities as a society and our values as a people. I believe in independence because I believe it will be better for all of us if decisions about Scotland are taken by the people who care most about Scotland - the people who live and work here. It is my absolute conviction that Scotland’s future should be in Scotland’s hands. I also believe that the bonds of family, friendship, history and culture between Scotland and the other parts of the British Isles are precious. England, Wales and Northern Ireland will always be our family, friends and closest neighbours. But with Scotland as an independent country, our relationship will be one of equals. I have no doubt that it will flourish. I want to be clear about what independence means and why the Scottish Government is asking you to vote Yes. The vote in September 2014 is about becoming independent from the parliamentary union of 1707 and passing to the Scottish Parliament the powers Westminster has over matters such as taxation, welfare and the economy, and securing for Scotland our own place in the world as an independent country. Last year, in the Edinburgh Agreement, the Scottish and Westminster Governments agreed to continue to work together constructively in the light of the outcome of the referendum, whatever it may be, in the best interests of the people of Scotland and of the rest of the United Kingdom. That is an important commitment from both Governments. It will help to ensure a smooth transition of powers from Westminster to Scotland. That constructive working together will continue after independence. We will work in partnership with the rest of the UK to share the pound for our mutual benefit, but we will pursue a Scottish tax and economic policy to boost jobs, growth and social justice. Westminster governments, rejected at the ballot box in Scotland, will no longer be able to inflict the poll tax or the bedroom tax on the most vulnerable people in our society. We will continue to work in partnership with the rest of the UK in defence alliances to promote peace and security, but we will be able to remove Trident from Scotland’s soil and stop paying towards the #100 billion lifetime cost of a new generation of nuclear weapons. We will work in partnership with the rest of the UK inside the European Union. But we will be able to represent Scotland at the top tables of Europe as a constructive member state and stand up for vital Scottish interests. Scotland will remain within the Union of the Crowns with Her Majesty The Queen as our head of state, but we will have a modern, written constitution. And the social ties between Scotland and the rest of the UK will continue and thrive. That is the independent Scotland we will negotiate following a Yes vote. We will do so in time for Scotland to become independent on 24 March 2016 and be ready for the first elections to an independent Scottish Parliament in the spring of that year. Of course some would prefer Scotland to become a republic, to leave the EU or NATO, or to have our own currency. After Scotland becomes independent, any political party seeking to make these kinds of changes would first have to win support to do so in an election. That is the real democratic value of independence - the people of Scotland are in charge. It will no longer be possible for governments to be elected and pursue policies against the wishes of the Scottish people. So other choices can be made, different from those we propose in this guide - but these will be the choices of the Scottish people. Independence will put the people of Scotland in charge of our own destiny. No-one is suggesting an independent Scotland would not face challenges. We would be unique if that was not the case. But we are rich in human talent and natural resources. We are one of the wealthiest nations in the world. With independence, we can build the kind of country we want to be. People down the decades have wondered if a country blessed with such wealth, talent and resources could and should have done more to realise the potential we know exists for everyone. Those generations could only imagine a better Scotland. Our generation has the opportunity to stop imagining and wondering and start building the better Scotland we all know is possible. This is our country. This is Scotland’s future. It is time to seize that future with both hands.